Four swindle stories, taking place successively in Tokyo - Japan (Les cinq bienfaiteurs de Fumiko), Amsterdam - The Netherlands (La riviere de diamants), Italie (La feuille de route), and Paris - France (L'homme qui vendit la tour Eiffel). During a war in an imaginary country, unscrupulous soldiers recruit poor farmers with promises of an easy and happy life. Two of these farmers write to their wives of their exploits. Follows a family-man who meets women through lonely hearts ads. Two Soviet partisans on a mission to gather food contend with the winter cold, the occupying Germans, and their own psyches. A jilted man (Jean-Paul Belmondo) rants at his mostly silent former lover (Anne Collette). Jacques Demy's debut dramatic short about a young man suffering from a broken heart. This is a blend of the bad, commercial work of journeymen French directors and the exciting new wave of Godard, Chabrol and Demy. Anger is the first sin to be treated, and Sylvain Dhomme does a terrible job with this silly story of flies in the soup provoking world catastrophe. Molinaro's version of Envy is no better. Philippe de Broca gets a fine hammy performance from Georges Wilson in Gluttony; some great satire of French country eating habits here. Jacques Demy is next with Lust, and he loses steam with a static visual style (none of the grace of Lola) and stiff acting. We can only surmise what he could have done with a better script. Godard has the best segment, he's got Eddy Constantine playing a loafer for a change, not his Lemmy Caution-like nerveless violence. The cheesy Hawaiian music suits the story well. It's more verite than we are used to from Godard. 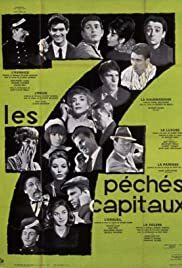 After Sloth, we get Pride from Roger Vadim, and the banality of the story is relieved by some good acting by Sami Frey and Marina Vlady. I always thought it was a shame Vlady wasn't more popular; she had a gorgeous sleek cat's face and could do comedy. Chabrol is last with Greed, and he shows the usual facility and empty social commentary we have come to expect from him.